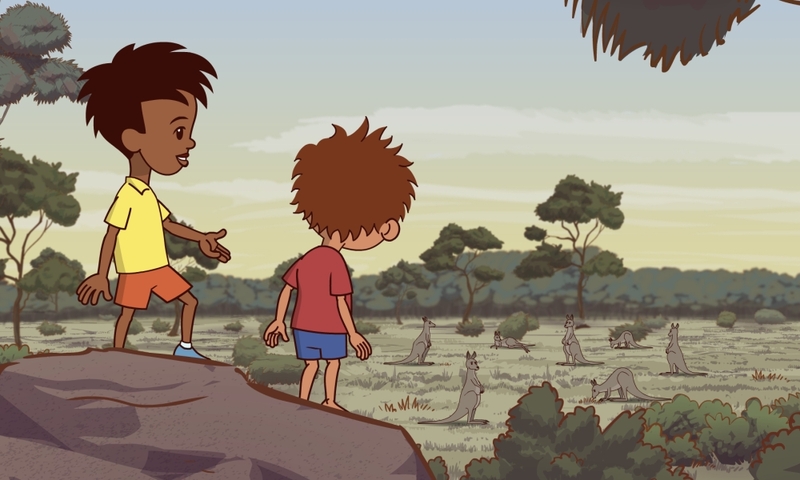 Little J & Big Cuz is an animated children’s series that follows two Aboriginal children who live with their nanna and lovable dog. The 13 episodes explore the unfamiliar world of school and how, with the help of their teacher Miss Chen, Little J and Big Cuz navigate typical school occurrences, like show-and-tell, lunchtime activities and school performances. The show has been devised, written and directed by Indigenous creatives from across Australia. The characters for the series are voiced by prominent Indigenous actors including Deborah Mailman, Miranda Tapsell and Aaron Fa’aoso. The animated nature of the series allows for re-voicing in Indigenous languages. Research Developments (RD) reports the series was borne out of a partnership between the Australian Council for Educational Research (ACER), Ned Lander Media, National Indigenous Television (NITV), Screen Australia, Film Victoria, Screen Tasmania and the Australian Children’s Television Foundation. Little J & Big Cuz forms part of a wider School Readiness Initiative, where ACER is working with support from the Secretariat of National Aboriginal and Islander Child Care (SNAICC) and Lotterywest to develop free support resources for teachers. ‘A team of experts convened to develop the resources, including Indigenous Education Consultants from both the early years and primary school sectors, and a former Senior Education Officer from ACARA,’ RD reports. The School Readiness Initiative has been informed by research, including the 2010 report Using television to improve learning opportunities for Indigenous children, by Dr Michele Lonsdale. ‘Studies show that television viewing is a popular activity for pre-school-aged children and that educational television programs can help improve children’s school readiness by building literacy and numeracy skills, cultural awareness, self-esteem and appropriate behaviours,’ the report notes. The Dusseldorp Forum is supporting an evaluation of the impact of the School Readiness Initiative for children, communities and schools. A 2016 literature review, completed as part of that evaluation, confirms the findings of the original literature review and highlights the evidence underlying the purpose of the series and its selected content, style and format. ‘Results from the evaluation will assist in developing future series of Little J & Big Cuz and will help to tailor resources in order to maximise the overall effectiveness of the initiative,’ RD adds. The TV series is set to be broadcast on NITV around Easter 2017 with subsequent availability on catch-up TV. Educators wishing to find out more about the series and free teaching resources can join the Little J & Big Cuz educator community.